Nexternal makes is easy for developers to build applications that integrate into its eCommerce platform. Once an application has been deployed, your application can be listed in Nexternal's App Marketplace to ensure that you can reach every merchant on Nexternal's eCommerce platform. 1.) 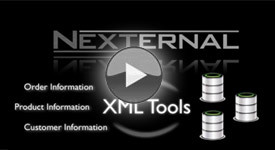 Nexternal's XML Toolset. Details on the ten powerful XML Tools and the XML Documentation can be found on this page. All Tools involve server-to-server communication using a REST architecture whereby the initiating server sends a Request XML document to the appropriate URL, then receives a Reply XML document from Nexternal, then parses that document and takes appropriate action to achieve the desired integration. 3.) The Nexternal Free Trial. By signing up for a Free Trial, developers will have an environment to test their application and ensure that it is ready to deploy to merchants. If you sign up for a free trial, please contact your Nexternal Represenative and they can extend the trial to any amount of time you request. 4.) The Nexternal App Marketplace. Once your App is created, email us or call us at 800.914.6161 so that your application can be listed.